This dress started with the fabric. 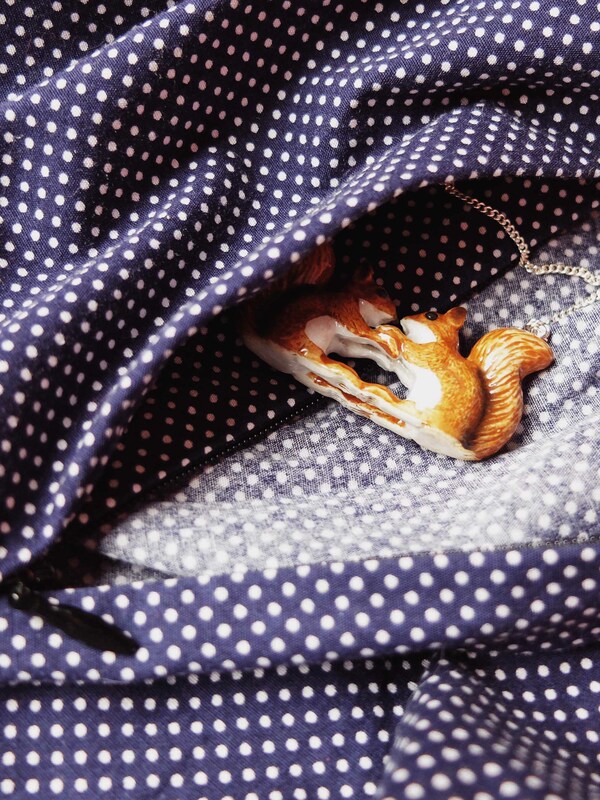 I bought it at Atelier Moondust during the sales and I immediately knew it would become a shirtdress. Unusually, I also immediately sewed the shirtdress in question. Not all fabrics can boast such a short stay in my stash! I chose the Camí dress because it’s the most basic (in a good way!) shirtdress pattern I own. I knew I’d have to make some fitting adjustments though: my first Camí fits awfully at the neck and shoulders. 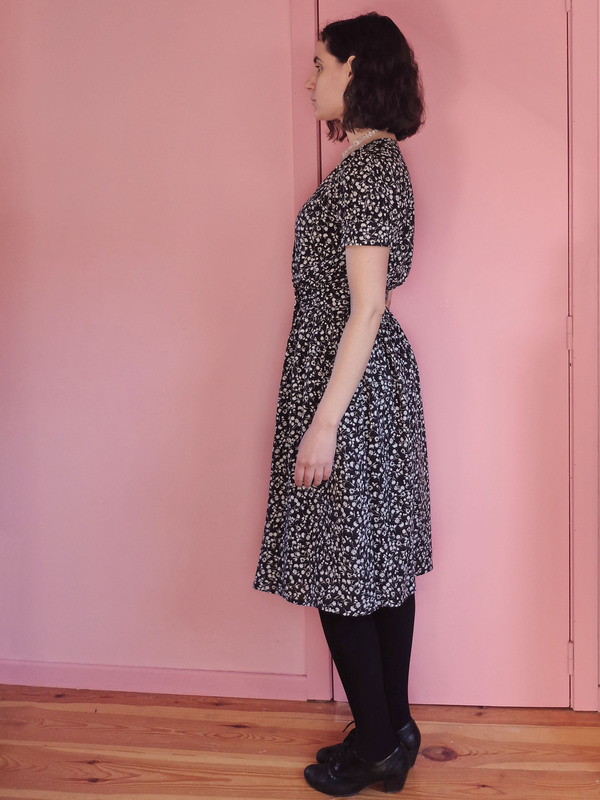 Since I wasn’t really sure about how to fix that, I thought of comparing the pattern pieces to the one other pattern I’ve sewn that has a collar with a stand, the Cardamome dress. And then I thought, why not simply blend the collar and shoulders of the Cardamome pattern with the rest of the Camí? So that’s what I did. It was not the easiest to do because of the yoke of the Cardamome, but it did work: this version fits way better than the first one. It’s still not perfect, but it’s getting there. I might try a broad shoulder and/or back adjustment in the future, and maybe something for my sloping shoulders. And shortening the back bodice, too. As you can tell from the pictures, I didn’t only make fitting adjustments; I also modified the opening: no more side zipper, but a full button band instead of the partial one of the original. It takes more time to put on or take off the dress, but I’m yet to get dressed or undressed in such a hurry that this poses a problem, and it’s also more comfortable to put on. And I love the look of the full button band so much! Oooh, speaking of the buttons, aren’t they lovely? They are vintage and I got them at the last Lille Braderie. I was so happy to find such a perfect use for them! Another change I made, which you can’t see in the pictures, is one I had also made on my first version, raising the too low pockets. The only real problem of this dress is… the fabric! 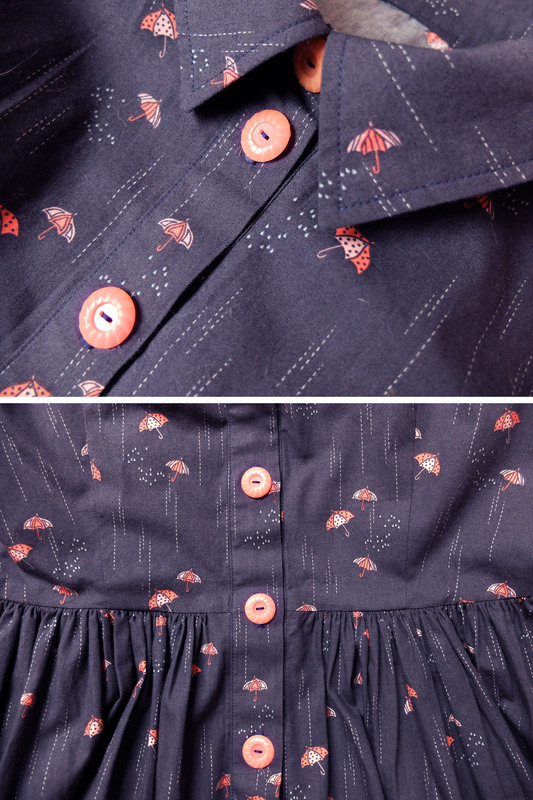 It’s the cutest with its adorable umbrellas and raindrops and everything, but man does it wrinkle, which makes it look a bit sloppy at the end of a day’s wear… Ah well, it won’t stop me from enjoying those little umbrellas! Anyway, here is my first shirtdress then! 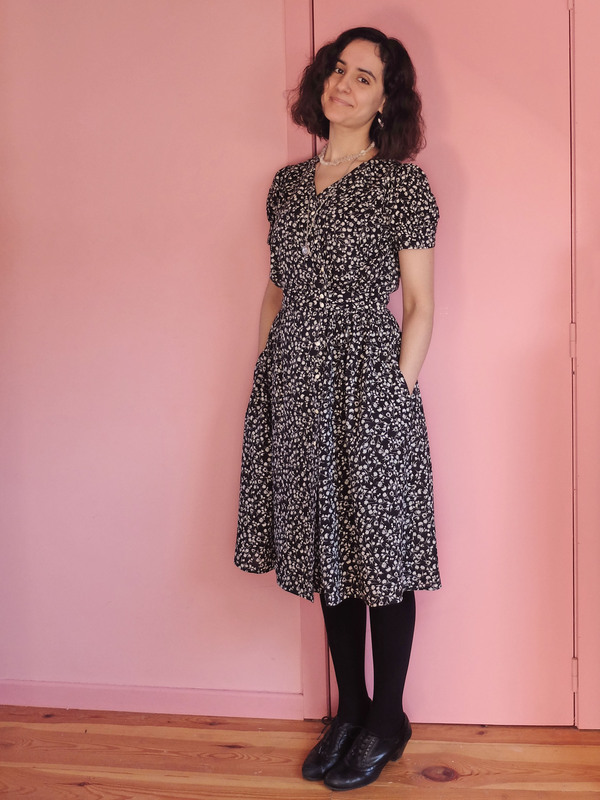 The pattern is Pauline Alice’s Camí dress. This version is actually a wearable toile: I used some very inexpensive cotton (the same as this one and this one but in a smaller scale) which had a few flaws so that it wouldn’t bother me too much if things didn’t pan out. The buttons are vintage, from my mother’s stash. I first cut a size 36 bodice with 38 shoulders, but it was way too tight so I sized up to a 38 with 40 shoulders. It’s still not a good fit at the shoulders nor at the collar, which sometimes hangs a bit funny, but it’s passable. I wonder if lengthening the collar stand buttonhole a touch could not solve part of the problem. At the moment this button is not perfectly in line with the rest of the buttons/buttonholes as it should be, and this makes the collar tighter than intended. Not truly uncomfortable, but less comfortable than the collar of my Cardamome. The rest of the dress fits well (I lowered the waist darts by 2 cm), contrary to what some of these pictures, taken after a day of wear, would have you believe. The waist could maybe stand to be taken in a tiny bit? I’m not sure. The shoulders fit better (and the collar points hang better, too) when the collar is open, but I always wear it closed, so that’s not a satisfactory solution. This has not stopped me from wearing the dress a lot, especially since I usually pair it with a cardigan! Still, I really must learn to fit my (giant?!) shoulders! I didn’t use the skirt that is included in the pattern but cut twice the whole width of the 150 cm wide fabric x (60 cm + waist seam allowance + wide hem) for an extra full skirt! I also added a buttoned breast pocket (inspired by Annie Coton’s Camí and using Pauline Alice’s optional breast pocket template). 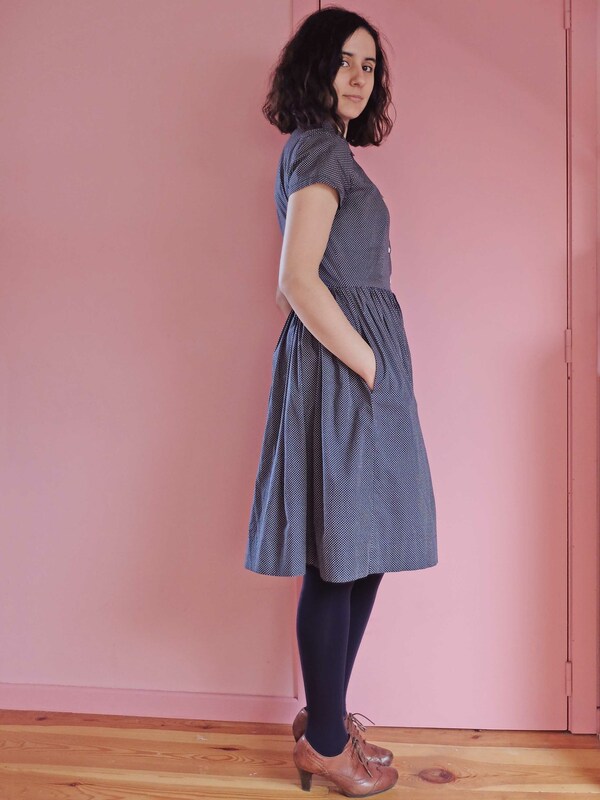 A lot of reviews of the pattern complain about too low pockets, and rightly so. I personally used Clémence’s nifty tutorial (in French, but she links to this one in English) to raise them and couple the left one with the invisible zip instead of placing it right under the zip. Another small complaint I have, which I haven’t read about anywhere, is the lack of precision of the pattern: a grainline arrow that isn’t parallel with the button placket by a couple millimetres (unless that’s intended? ), shoulder and side seams that aren’t the exact same length on the front and back pieces (and yes, I triple checked, my tracing isn’t to blame)… Nothing serious, but it does make it look a little bit amateur, and I prefer it when things are more rigorous. I don’t remember encountering the same kind of issues making my Quart coat, so I’ll chalk that up to the Camí being Pauline Alice’s first pattern. 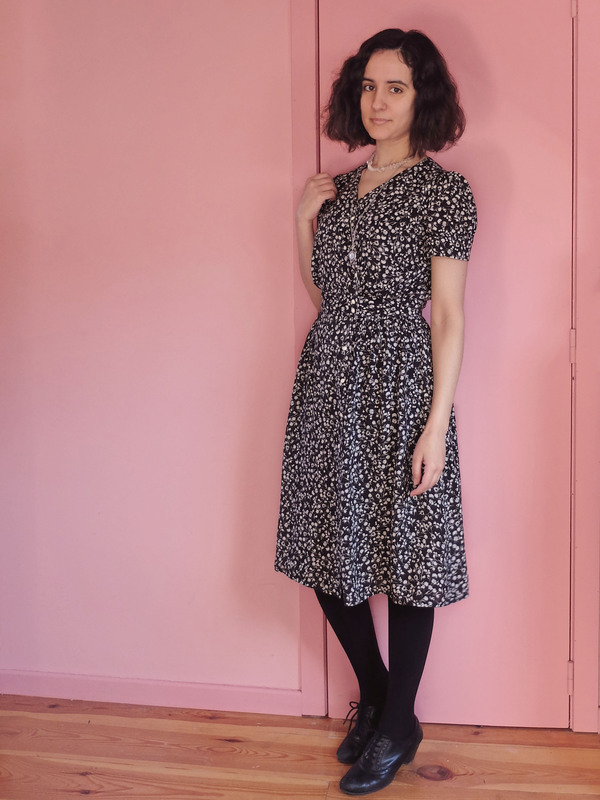 I’d really like solving my shoulder fitting problem on this pattern, so I do intend to sew it again, but first I want to try the other shirtdress patterns I have in my stash, so it may take a while before I revisit this one! 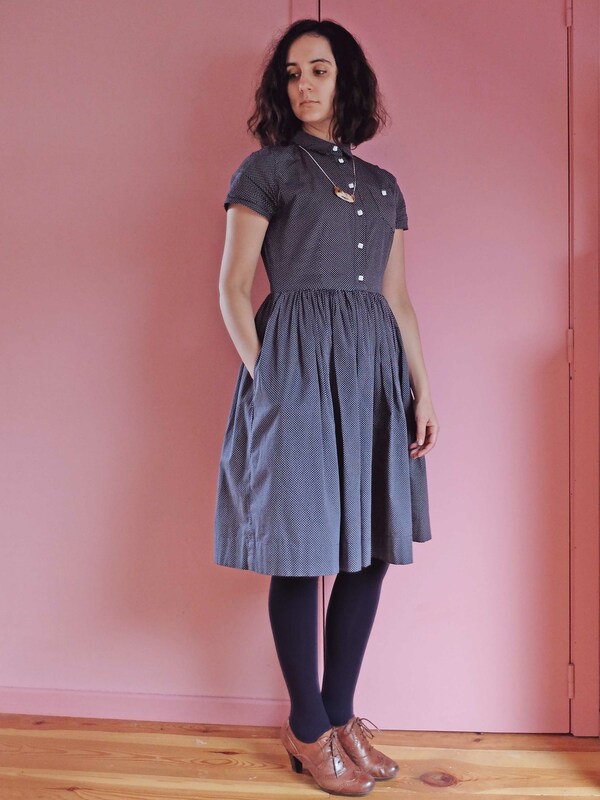 Just you wait until I find my TNT pattern and the shirtdress might become the new gathered skirt! Woohoo, I can’t believe I’ve caught up on months of blogging slacking in less than two weeks! I have to say, being on holiday has helped a lot (who would have thought? ), as well as setting myself a deadline. I’ve kept the best for last: my Quart coat is by far my proudest sewing achievement this year! Proudest sewing achievement ever, in fact! I can see that it’s not perfect, and these pictures are particularly unforgiving, exacerbating each and every wrinkle and crease, also made worse by the fact that I have been wearing the coat every day since its completion, but I’m still very proud of all the work and time I put into this project. 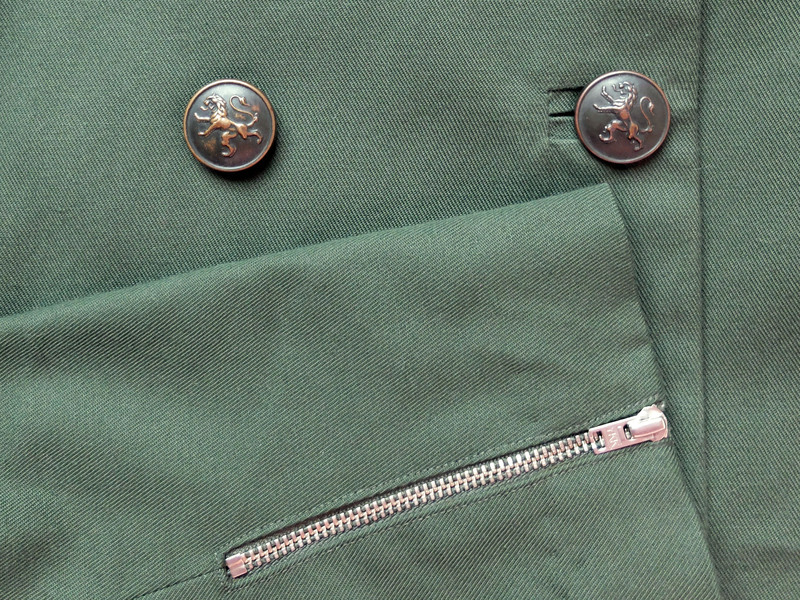 I had been in dire need of a replacement for my Minoru jacket, whose pockets had literally started to disintegrate after three years of daily wear, so when I stumbled upon this olive green heavy water-repellent cotton twill at €3 a metre (!) at Tissus Passion last September, I didn’t think twice and bought 4 metres, more than enough for any coat or jacket. 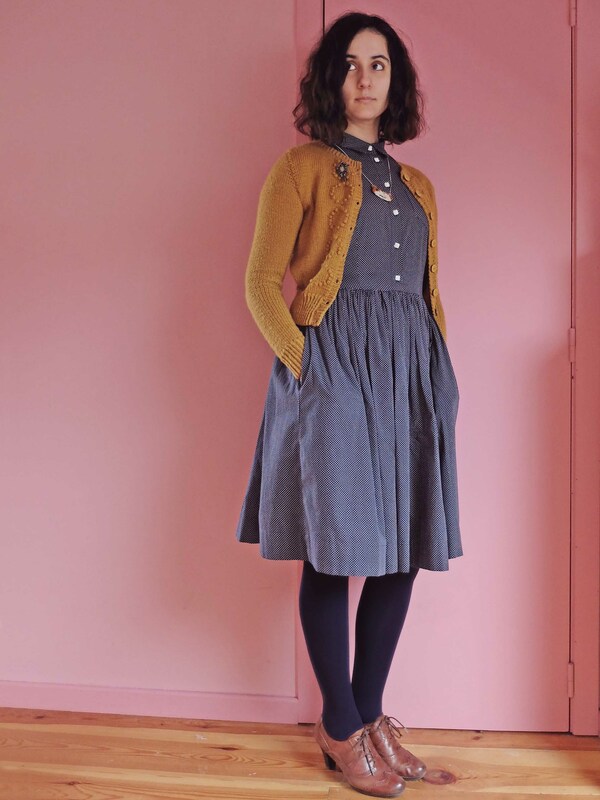 It didn’t take me long after that to choose Pauline Alice’s gorgeous Quart coat as a pattern, which I bought the very same day. The Venezia lining was in my stash. I traced the pattern almost as soon as I got it, but then I got cold feet and sewed a few easy projects before finally starting on the coat for real in November. This was my first time sewing a Pauline Alice pattern, and I like living dangerously so I didn’t make a muslin. I looked at the size chart and cut accordingly: a 36 for the bust and waist graded to a 40 for the hips. It’s alright for this twill coat that is not intended to be worn with a lot of layers underneath (usually a dress or a t-shirt with a hand-knitted cardigan or sweater, which is what I’m wearing in the pictures), but had it been a winter wool coat meant to be worn over thicker layers, I think it would have been a size too small at the shoulders. Sewing the coat took me about a month, broken down in steps I could complete here and there. The only thing I found truly hard to deal with (had it not been near the end of such a long project, I’d have thrown the towel!) was attaching the lining pleats to the exterior fabric pleats: after a few trials and errors, I found it easiest to press the bottom of lining and main fabric flat to get rid of the pleats, and reshape the pleats once everything was attached. Other than that, the Quart coat is a loooong project to take on, but there’s nothing difficult to it. I was impressed by the instructions, which I followed to the letter: I thought I’d need the step-by-step tutorial, which I downloaded from the website, but in the end I found the pattern instructions to be sufficient. I think there was only one step that had me stumped (step 36 for anyone making the coat – I thought I was supposed to start stitching at 4 cm from the bottom edge of the main fabric while you have to start at 4 cm from the bottom edge of the lining), but Mimolette helped me understand this one and I was back on track. I bought the thinnest shoulder pads I could find at Veritas and made my own sleeve heads with some fleece from my stash. I used Karen’s e-book (which I had bought two years ago for that coat I never finished) to brush up on my bound buttonholes and everything went swimmingly. 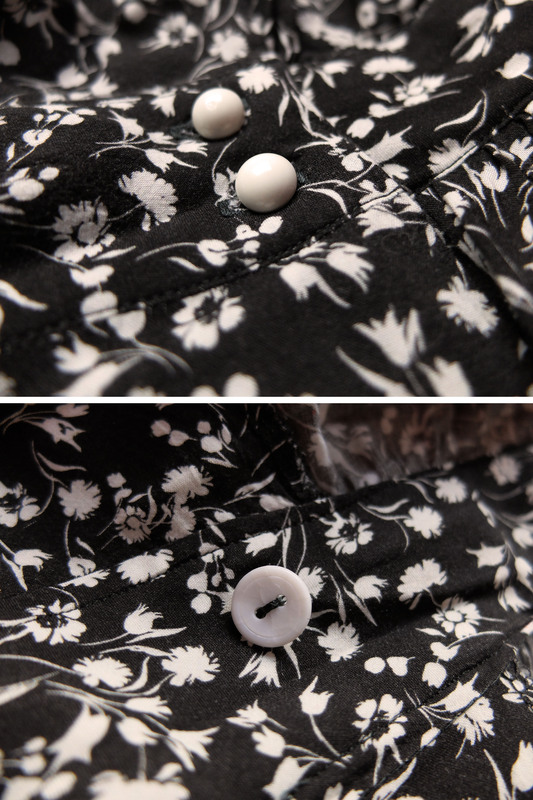 As for the buttons, they are probably my favourite part of this coat! I wanted some military buttons to go with the style of the coat, and when I couldn’t find anything I liked in any local shop, I had the idea of searching on eBay, where I found the perfect buttons, sold by someone living here in Brussels! 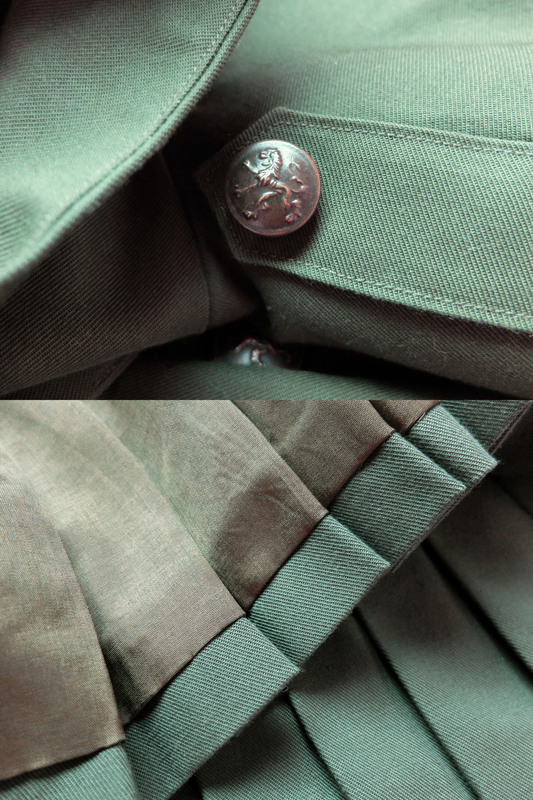 They are Belgian army uniform buttons from WWI (big ones at the front, small ones on the epaulettes), and I love the touch of history they add to my handmade coat. Not to mention, I think they look so much nicer than what I had found in shops! I was a little bit disappointed when I wore the coat for the first time on my bike because the sleeves suddenly seemed too short… Luckily, it’s nothing a pair of fingerless mittens can’t fix, and I think I was just spoiled by the extra long Minoru sleeves, drafted with a cyclist in mind. Something to keep in mind for the next time I make a coat or a jacket, but honestly, that won’t stop me from wearing this one to death!